After being discontinued in 1971, the proud and popular Acadian nameplate made a comeback late in 1979. This time it bowed not as a brand of compact car but under the Pontiac banner as GM Canada's feisty import fighter. The newest subcompact in Oshawa's stable would have its work cut out for it, doing battle against the Top Ten imports: Honda, Toyota, Datsun, VW, Mazda, Lada, Subaru, Chrysler’s Mitsubishi, Renault and Audi. These value-loaded offshore offerings would grab 21 percent of the domestic market during the 1980 model year, the highest total in decades. Aside from international competition, there were plenty of domestic contenders, too. 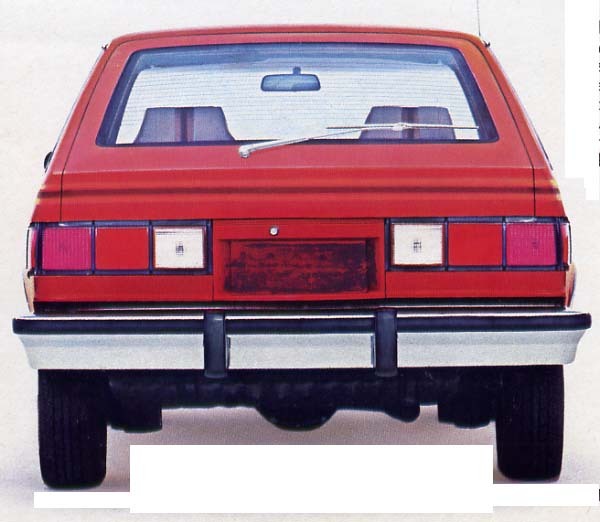 In addition to its cousin the Chevrolet Chevette, Ford’s Pinto and Mercury Bobcat, AMC’s Spirit, the Dodge Omni, Plymouth Horizon and Chrysler Expo already filled the field. Badge engineering was employed on the Acadian. It received the Pontiac emblem and Acadian decals, complete with a distinguishing maple leaf. Other than that, it was virtually identical to the Chevrolet Chevette. Still, there was a need; Canadians had been shopping at their Pontiac-Buick dealers for thrifty little Vauxhalls since 1948. With the demise of the ill-fated Vauxhall Firenza in 1973, that entire subcompact segment of the market had been lost. Dealers were acutely aware of the sales that slipped through their fingers during the four-year absence. The addition of the Acadian to showroom floors was good news, indeed. Introduction of the Acadian was most timely. Gasoline prices rose dramatically as the National Energy Board and Alberta squabbled bitterly in public over production quotas and tax rights. The Bank of Canada continued to hike interest rates in a desperate bid to shore up a sagging dollar. Weary consumers were caught in a nightmarish spiral of double-digit inflation and shrinking earning power. From groceries to mortgages, everything cost more and debt loads rose dramatically. Those who were in the market found small economical cars more desirable than ever before. Advertising for the pint-sized Pontiac hit home with an anxious public. “No mistake about it. The 1980 Pontiac Acadian offers something you just don’t see much of now. Your money’s worth. That’s why we’re proud that Acadian continues the tradition of being a lot of car.” Cashing in on its GM heritage, it boasted a unitized Body by Fisher. Designed in West Germany as General Motors’ first attempt at a car for the world market, the Chevette first bowed through GM’s Brazilian subsidiary in the spring of 1973. Model variants there included a pickup truck. In September of 1973 it was introduced in Germany as the third generation of the Opel Kadett. In the fall of 1974 it was built for the Argentine market as the Opel K-180. In November, the Japanese could buy it as the Isuzu Bellett Gemini. 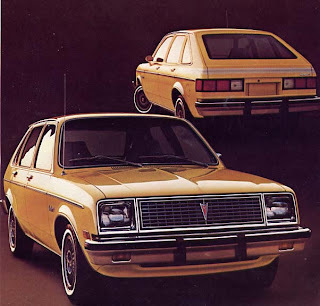 In 1975, Britons met the Vauxhall Chevette, Australians said ‘good day mate’ to the Holden Gemini and North Americans greeted the Chevrolet Chevette. Acadian could be had as a two- or four-door hatchback. A stripped S version listed at the rock bottom price of $4,345, putting it squarely in league with Lada, the lowest priced car on the domestic market. Pontiac’s little foot soldier came with a number of standard goodies including front disc brakes, rack-and-pinion steering, a diagnostic connector for quick hook-up to the computer at the dealership, a fold down rear seat and a centre floor console, the latter installed on all but the lowest price S Hatchback Coupe. Interiors of the base S model were finished in Black or Camel-coloured vinyl or cloth. Higher cost models offered interior choices in Blue and Carmine as well. 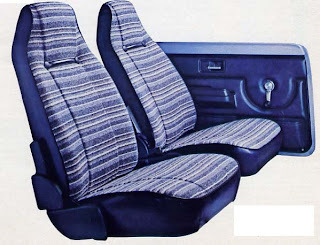 Top-of-the-line Acadian Custom interiors could be had in upscale vinyl or custom cloth finishes. Seats reclined on all models but the S. Advertising promised that a “liberal application of acoustical materials” had been used throughout but then there was an optional custom interior trim package that packed in more insulation—just in case. Entry-level vehicle that it was, Acadian came with a goodly number of extra-cost options to dress it up. Customers were invited to “build your own Acadian.” Sunday best niceties included an intermittent windshield wiper system, a Comfortilt steering wheel, colour-keyed seat belts and floor mats, sports mirrors with remote control operation for the driver’s side, air conditioning, tinted glass, an AM/FM radio and the requisite number of speakers, a three-speed automatic transmission, the Delco Freedom heavy-duty battery, a roof rack, wheel trim rings, sport wheel covers, steel-belted radial ply tires, an auxiliary lighting package, an electric clock, a tachometer, an electric rear window defogger, exterior striping and for all but the very early production models, a rear window wiper-washer. A very useful and important option was the Continuous Protection Plan, designed to extend the warranty. Exteriors were finished in three coats of paint. Colour choices were Beige, Black, Bright Blue Metallic, Dark Blue Metallic, Light Camel Metallic, Dark Claret Metallic, Grey, Dark Green Metallic, Red, Red Orange, Silver, White and Bright Yellow. In addition there were five smart two-tone colour combinations. A total of 19,361 Pontiac Acadians were built during the 1980 model year. They did their job well, helping GM Canada to have its second best year on record despite the deeply troubled economy. I still have my 1986 Acadian. It's been sitting in my parents barn for the past 10 years while I've been off to school and South Korea. I do miss it and am considering bringing the old girl back to life when I move back to Canada next summer. yahh.. good idea dude.. get it back and the OLD school as well. I used to own a 79 many years ago..... Just bought a 1980 a week and a half ago. Awesome little cars.